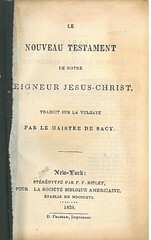 Title: Le Nouveau / Testament / de Notre / Seigneur Jesus Christ / en Francais, / sur la Vulgate. / Traduction de L. M. De Sacy. / Revue sur les Meilleures Editions. / Vol. I. [& 2] / Boston: / De L'Impremerie de J. T. Buckingham. / 1810. 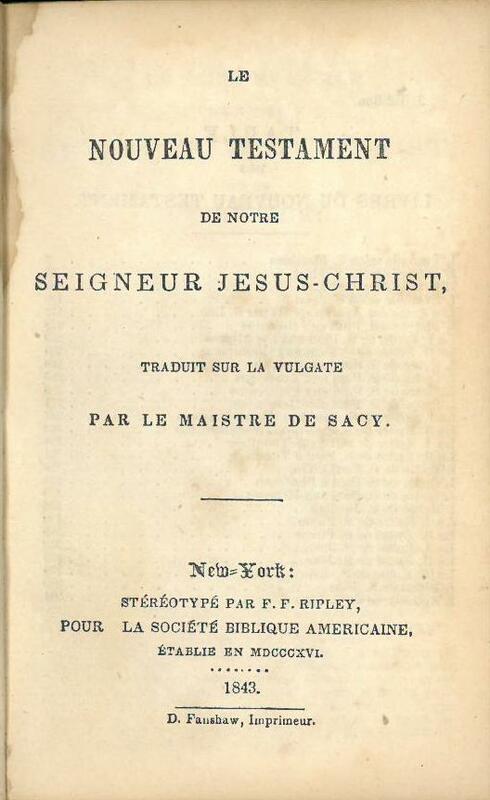 Comments: The first French edition of Scripture published in the Western Hemisphere; the first Catholic edition of Scripture published in America to have an American Imprimatur. 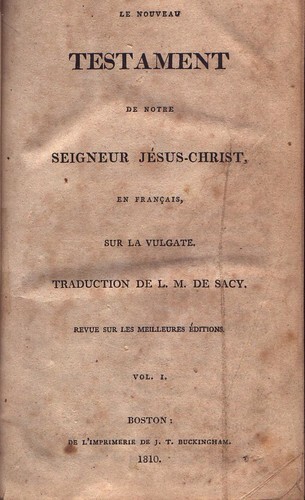 Title: Le / Nouveau Testament / de Notre / Seigneur Jesus-Christ, / traduit sur la Vulgate. / par le Maistre De Sacy. / New York: / Stéréotype par F.F. Ripley, / pour la Société Biblique Americaine, / établie en MDCCCXVI. / 1838. / D. Fanshaw, Imprimeur. 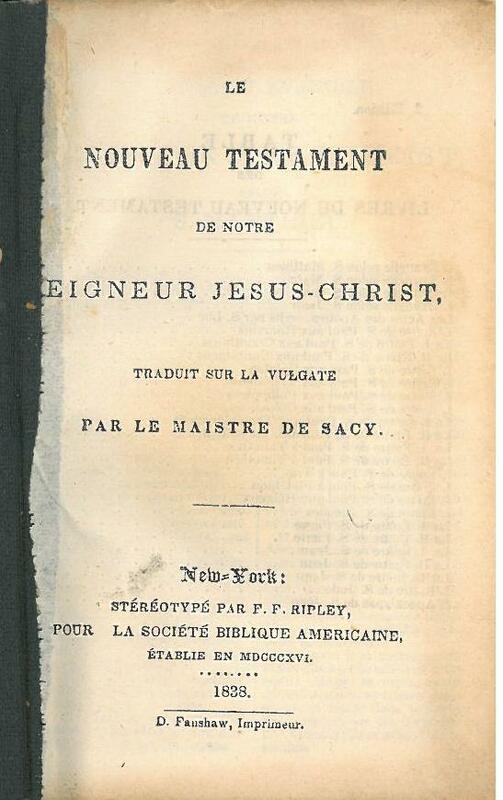 Comments: The de Sacy translation was published by the American Bible Society without an Imprimatur. It would appear that two editions were published in 1838; some copies read "1. edition" on the verso of the title page while others read "2. edition." Title: Le / Nouveau Testament / de Notre / Seigneur Jesus-Christ, / traduit sur la Vulgate. 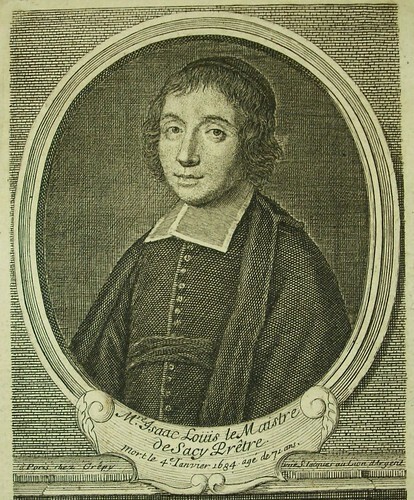 / par le Maistre De Sacy. / New York: / Stéréotype par F.F. Ripley, / pour la Société Biblique Americaine, / établie en MDCCCXVI. / 1843. / D. Fanshaw, Imprimeur. Comments: It would appear the two editions were published in 1843; some copies read "3. edition" on the verso of the title page while others read "4. edition."